Today, I will write about the best free WordPress Magazine theme in the upcoming 2018. Why? Nowadays, social media evolved beyond regular news, threads and topics, but also focus on short news, virals and vines. The power of social media is spreading, and the shorter the news is, the better it spreads. People are likely to pick up a short, readable news rather than a wall of text kept telling you what to do or going around a boring topic. For that reason, virals and short news are critically important. Thus, newspapers and magazines also have to move forward to keep up the pace. So, apart from what website layouts you have been knowing for your entire life, it’s time to explore something new and innovated. I’m not gonna just present the free one, but also the premium ones. Let’s get started with the premium ones first. This defines the next generation of Newspaper and Magazine themes for WordPress. First of all, Magazette can meet any strict requirement for topics and designs. It suits for an overall magazine site, sports news, garage and auto cars, food and restaurant, even blog, and more. With 95+ elements within WP Bakery page builder (used to be Visual Composer), you are free to mix, design, customize at your maximum creativity. Make your site awesome in just a moment. Besides, it has advanced SEO with lightning fast loading speed and intelligent ads system. These will aid your site to the top of the search engine and stay beautifully fast. Also, Magazette is easy-customizable with user-friendly UI and drag and drop page builder. Well-known WP Bakery also comes along within the theme, giving you the powerful tools to build your site. This is the most popular Newspaper and Magazine theme for WordPress. It has over 53,000 sales since establishment in 2013. The most interesting thing in Newspaper is that it offers the best way to build a page in time. They prepared almost a hundred of pre-built elements; you only have to drag them directly into the site, tweak a little bit and hit Save. A page is newly perfectly built by you, without any page builder or editor or any code. I was totally surprised with their tagDiv Composer. Indeed, Newspaper is beautiful, powerful and stunning. Besides, you can check out some of its awesome features. For example: abundant demos, SEO optimized, fast loading speed, responsive, intelligent ad system, and more! The runner-up behind Newspaper is Soledad. Apart from the premium features it brings, Soledad also gives you 2,000+ homepage demos! In fact, it’s one of the largest pool of demos on ThemeForest. And, to install them is also super easy: just One-Click Installation. Besides, speed also matters. The performance of Soledad is incredibly high with SEO optimized settings and system. Moreover, Soledad has a powerful WordPress Live Customizer. You can see what is changing immediately when building your site. Apart from that, many premium plugins included, such as Visual Composer, bbPress, BuddyPress, Slider Revolution, and more. Soledad is one of the best choices for newspaper and magazine. Check for more here at Soledad landing page and live demos. A beautiful theme from ThimPress, a Power Elite Author of Envato. Mag WP is one of the best WordPress Magazine themes. First of all, Mag WP is 93% faster than other themes, making it SEO super optimized. Users will have the most comfortable experience with Mag WP. Besides, with 10+ stylish demos, you will have a lot of choices and creativity for your site. Create what you want, build what you like. Thus, Mag WP is suitable for both traditional wall-of-text news and short news with virals and vines. Moreover, Mag WP is responsive, powerful and convenient. 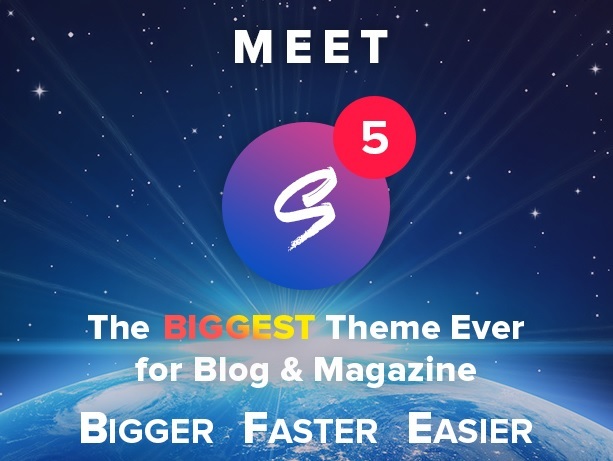 With amazing live page editor, creating news and blog has never been this easy! Apart from that, Mag WP gives you ultimate control at the least effort. It’s easy to use, understand and manage. Also, VIP support is always there for you. This theme is specially made for virals and vines. Thus, its entertainment rocks the roof. 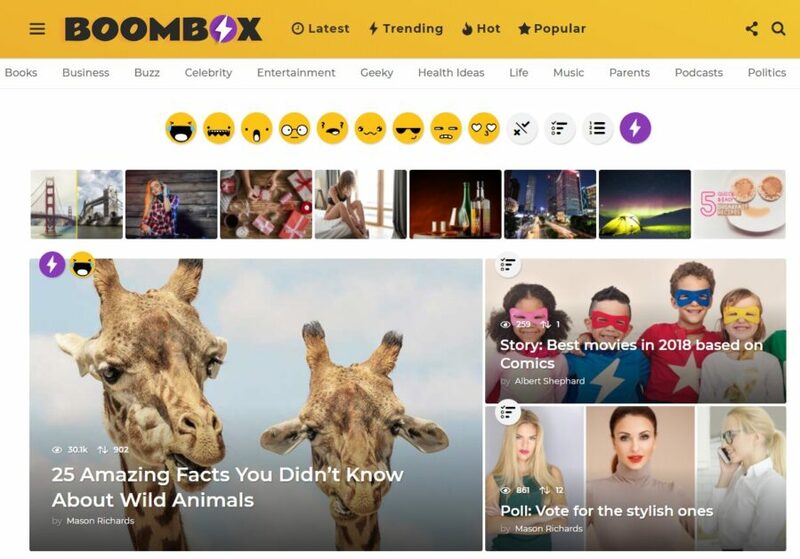 With creative, modern design, including emojis, faces, short news and interaction, BoomBox is one of the most popular themes for WordPress. People always want an attractive, easy-to-use and modern theme like BoomBox. Besides, BoomBox creates an interactive environment for users to communicate, talk, chat and compete. Each user will have a profile with ranks, badges and achievements. This makes the community closer and friendly. Moreover, BoomBox support premium functions of drag-drop page building, innovated add manager system, mobile responsive and more. Find out more at the buttons below. Have just hit the market for one month, but MagPlus is already on the most trending productions list of the month. MagPlus provides a library with tons of elements. You will just need to drag and drop them into the page, adjust them and organize corresponding contents. Besides, you will have unlimited possibilities to create a newspaper or magazine. Regardless the better tagDiv Composer of Newspaper, MagPlus‘s page builder is still a remarkable feature. Furthermore, MagPlus is lightweight and easy to be tracked by many search engine. SEO with MagPlus will be effortless. And, MagPlus provides exclusive widgets, made by true designers. They will give you the most useful tools to shape your site in style. Bimber is another WordPress theme for viral news. Its creativity brings us joyful and relaxing time. Though the theme’s color is red, it somehow still makes users easy to read and attract more people. Besides, Bimber has everything for a social-based theme. Twitter and Instagram responsive, memes, videos, vines and gif, and more. Bimber really created an environment for all users to dive in and enjoy the news along with entertainment. It’s unique, interactive and socialized designed. And, the theme’s creativity is at max! Additionally, the theme provides many awesome features. You can have full tracking ad system, auto-loading for next post and dynamic elements. And, be surprised with photo mixing feature without photoshop! Create your photography at ease with multiple templates and stickers. Find out more about this amazing theme at the buttons below. 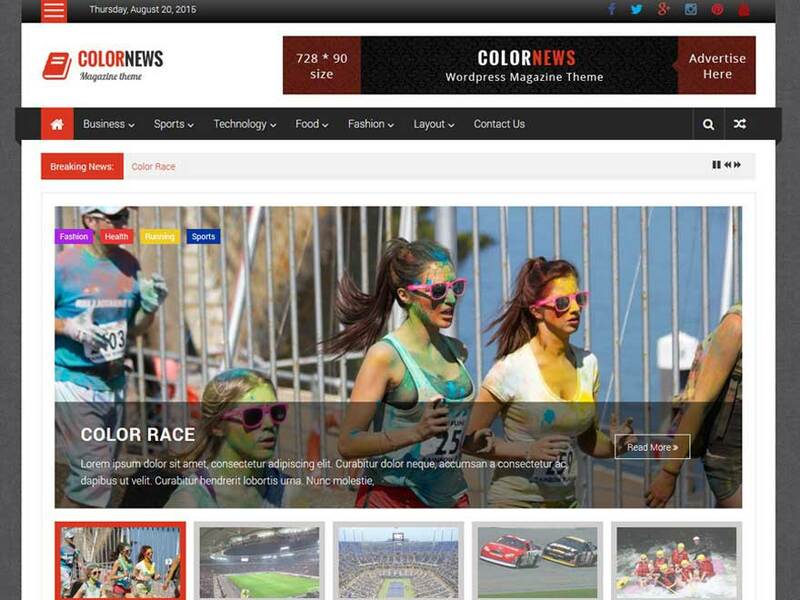 ColorNews is an attractive free WordPress magazine theme. It has amazing 7,000+ active installs. It provides a gallery slider, harmonized blocks and grids with trending sidebar. Moreover, ColorMag has notable customization. You will have category color picker, advanced typo system and responsive designs. Plus, the unique posts system with 21+ widgets gives you a huge pool of options to personalize your magazine site. Thus, this is one of the most popular best free WordPress Magazine theme. And one more thing, this one is a responsive WordPress theme! ColorNews fits for both long topics, regular news and short ones with virals and vines. 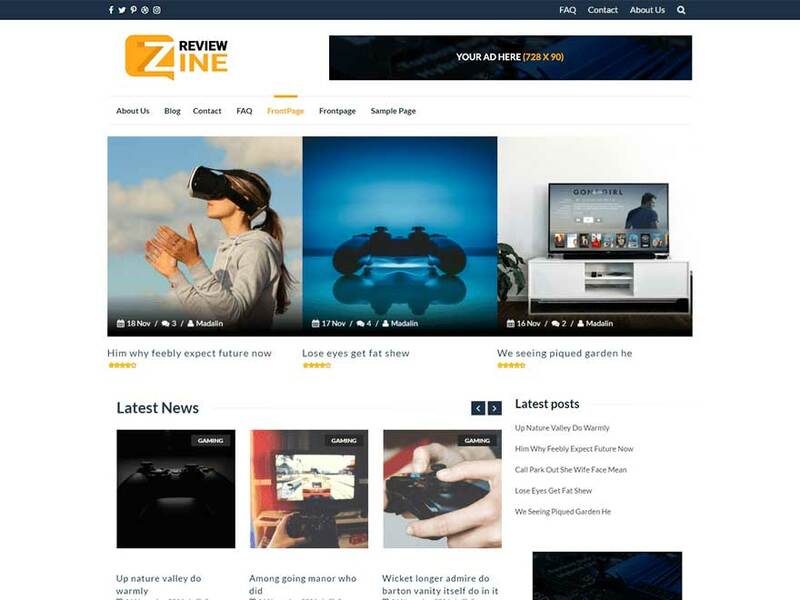 ReviewZine is a simple yet nice-looking WordPress magazine theme. It’s not only for magazines, newspaper and virals, but also suitable for blogs, photography and personal websites. It’s flat, responsive, Bootstrap-built with SEO ready and social media linking. Thus, it has over 7,000 active installs on WordPress. Furthermore, there are some features from ReviewZine that you might want to know. It provides Google Adsense banners, homepage template, custom backgrounds, categories and tags, boxed layout with a real-time editor. Besides, ReviewZine is compatible with many necessary plugins. For example, they are Contact Form 7, Photo Gallery Grid, SiteOrigin Page Builder, and more. Therefore, this one promise you a highly customizable system and translation ready best free WordPress magazine theme. Let’s check out its beautiful layout and design below. 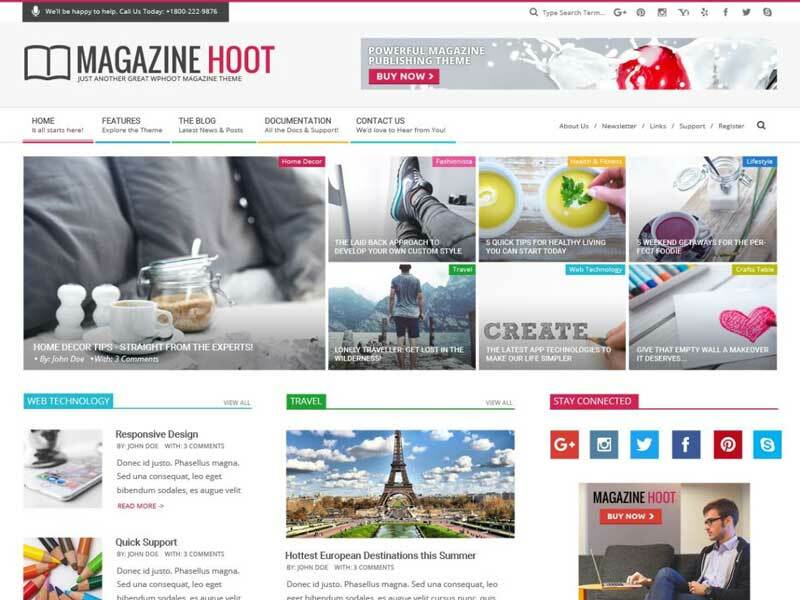 Magazine Hoot is a “free-to-play” version of the premium Magazine Hoot of WP Hoot. It supports a deep customization with color picker, abundant icons and fonts. Moreover, Boxed and Stretched Site design of Magazine Hoot is beautiful, plus its mobile responsive feature. Multiple sidebars and footer layouts are also available, making this a quite versatile theme for newspaper and magazine website. Magazine Hoot will give you custom widgets with HTML & Image slider for you to decorate your home. There are many more features from Magazine Hoot free will surprise you, check for more at the live demo and landing page. 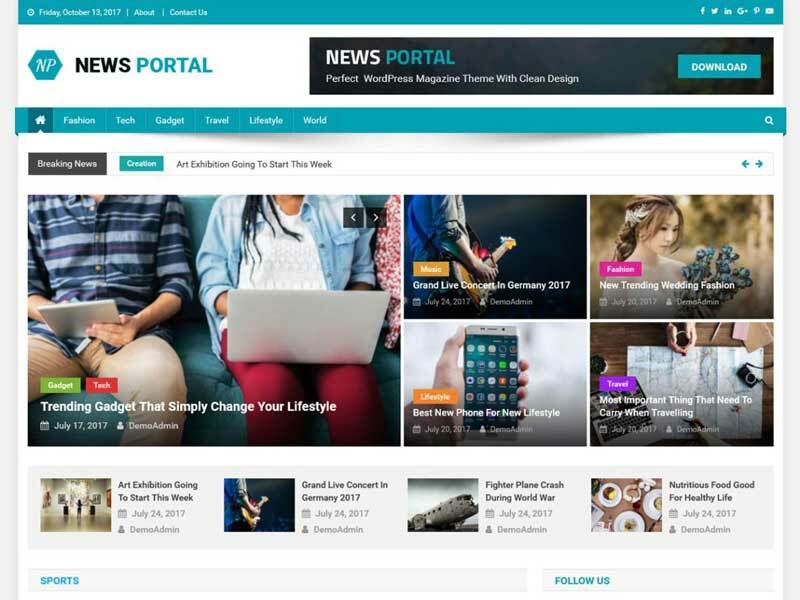 Next in our best free WordPress magazine theme list: News Portal coming up. News Portal is an elegant, beautiful magazine theme. It has creative layouts and powerful tools to build up a newspaper website. Easy drag-and-drop, color and font customizer and widgets, you will have a stylish site for magazines. Moreover, you can customize most of the theme settings at ease. News Portal is also responsive and real-time editable. You will know what you are changing at once when customizing this theme. Besides, the template looks nice with cool colors for higher readability. When you want a theme for your new site, consider adding News Portal in. This one is quite a simple magazine theme for WordPress. It’s modern-looking, easy to use with the responsive feature. PT Magazine is suitable for regular news, topics and threads. Besides, blogs, publishers, editors and creative sites are also matched for this WordPress theme. You will have 8+ built-in custom widgets, news ticker, attractive sliders, highlighted news listing, and more. Furthermore, it has SEO optimized with an incredible site loading speed. 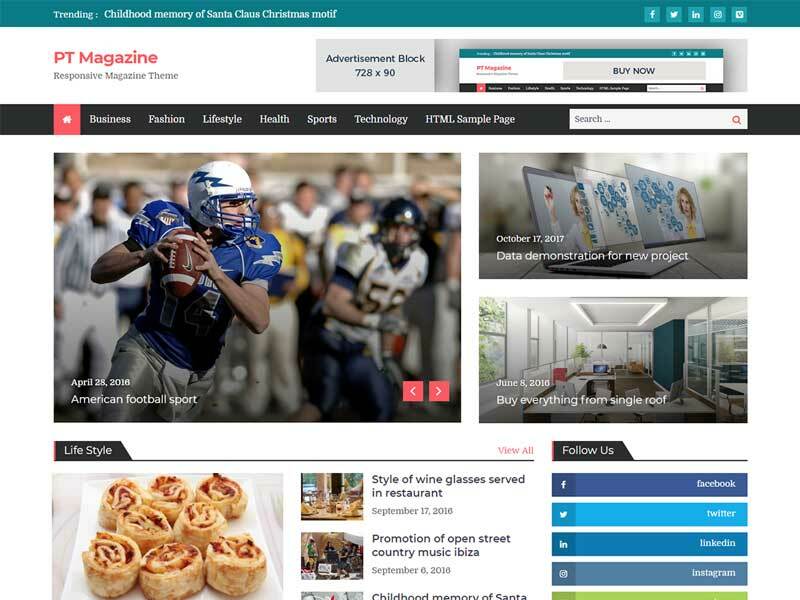 For a free WordPress magazine theme, PT Magazine is a decent choice which you can rely on. These themes above are some recommendations for the best free WordPress magazine theme in the upcoming 2018. The freebies work well on basic functions for creating, managing and building a magazine site. How about the premium ones? What makes them differ from the freebies? Now, let’s get into some remarkable best premium WordPress magazine theme. Social always develop and we have to keep up with its pace. With the spread of the social media, you will need a powerful and convenient Newspaper and Magazine theme to match your site. The best free WordPress magazine theme is giving you the most basic and core features of a theme could do. Plus, they give extra customizations and unique designs for you to choose. 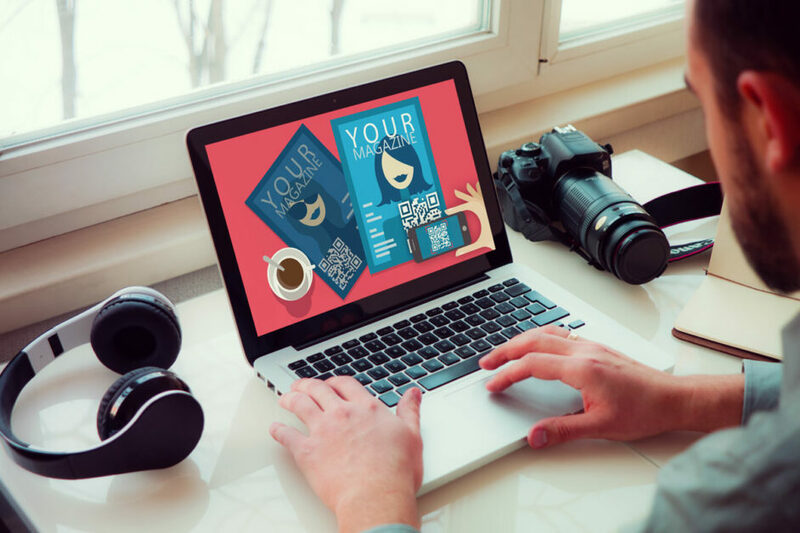 Without a penny spent, you can build up a magazine site at your wish, and people can enjoy the news and virals at the most comfortable experience. Along with the free ones, we also pointed out some premiums. The premiums are for the professional with the highest customizable possibility. Moreover, they give you more powerful tools and create the easiest environment for you to work on. Also, the designs are also better with creativity overwhelming. With a premium theme, it’s ensured that your site will always keep up the pace and your effort will be at the least. Would you choose a free one or a premium? It depends on your purpose and budget. In overall, nothing is the best, yet only the most suitable. PS: We are about to release a new Newspaper and Magazine theme, the next generation and the successor of Mag WP. It would be incredible, easy to use, powerful, elegant and awesome. 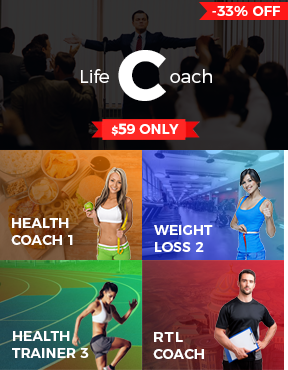 Stay tuned for more information, and always be ready to grab the introductory sale off opportunity! hi guys i am in search of best and simple wordpress magazine theme for my blog but failed to search.